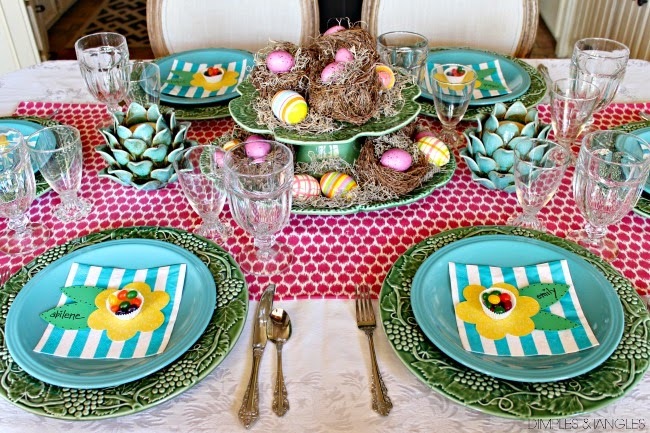 This year we'll be hosting my family at our house for Easter, so I spent yesterday setting the tables so they would be all ready to go. For the most part, I use what I have without buying anything special, so it's always a challenge to come up with something new! In the dining room, I wanted a fancy garden feel. I started with the large birdcage that I found at Goodwill several years ago and built around it. I love this birdcage, and wish that the bottom totally opened up so I could fill it with larger things or plants, but there's one tiny door that I was able to squeeze some candles through. This look could easily be copied with any type of birdcage, or even a grouping of several smaller ones. As I started pulling other things to use, I thought a few blue and white pots would add a nice bit of color for the otherwise neutral setting. I picked up the succulents at Ikea a few weeks ago. I also ended up with some shine and mixed metals, and some added texture with the woven placemats and bird nests. 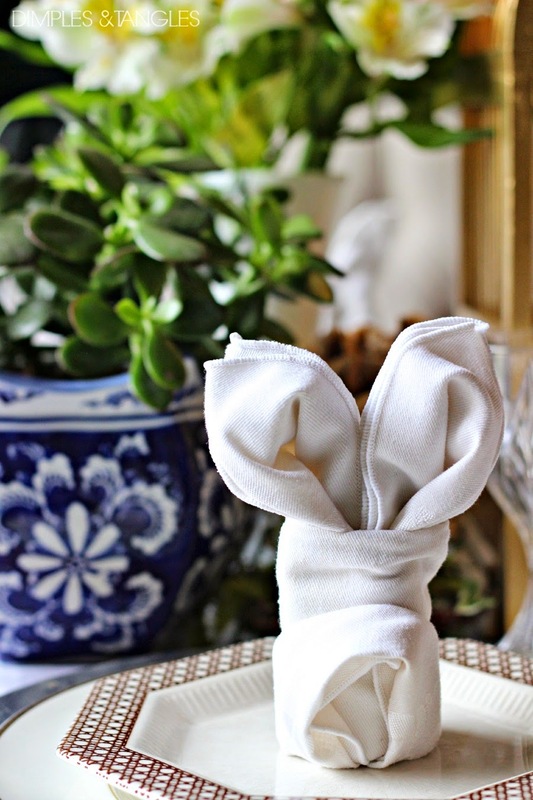 I used this tutorial for the cute bunny napkins! Once I figured the first one out the rest were easy. I did have trouble getting them to stay together on their own, so there is one pin in the back to secure the shape. In the kitchen, I used more color. 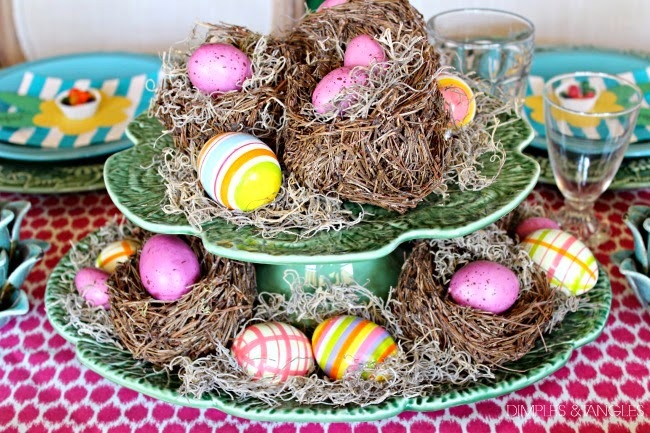 I started with stacking a Bordallo platter and cake stand for the centerpiece and filling it with nests, spanish moss and eggs. Couldn't be easier and you could use any kind of platter and stand for this, or even stack several cake stands together. I just didn't have two green ones, so I used the platter for the base. I've picked up all of my Bordallo at Ross or TJ Maxx over the years, and the cake plate was a gift from Ray's Mom, but I believe it came from Tuesday Morning. I had these turquoise plates in the garage sale pile, but had to pull them back in. I always love this color for Easter! 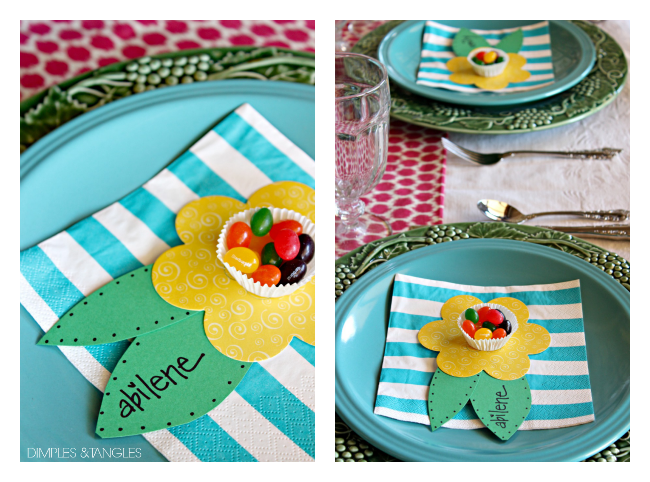 The napkins are paper from Ikea, and I used more die cut flowers for the place cards. I've had the artichoke candleholders for several years, they came from Hobby Lobby. So since the tables are done, now I'm off to clean house, grocery shop, cook, and finish up a project or two! Our kids are out of school tomorrow, so I'll see you Monday. Easter blessings to you! P.S. : Just as I was wrapping up this post today, I read this. As we celebrate Easter this weekend, this really gets down to the heart of the matter. It challenged and encouraged me, and I hope it does you as well! 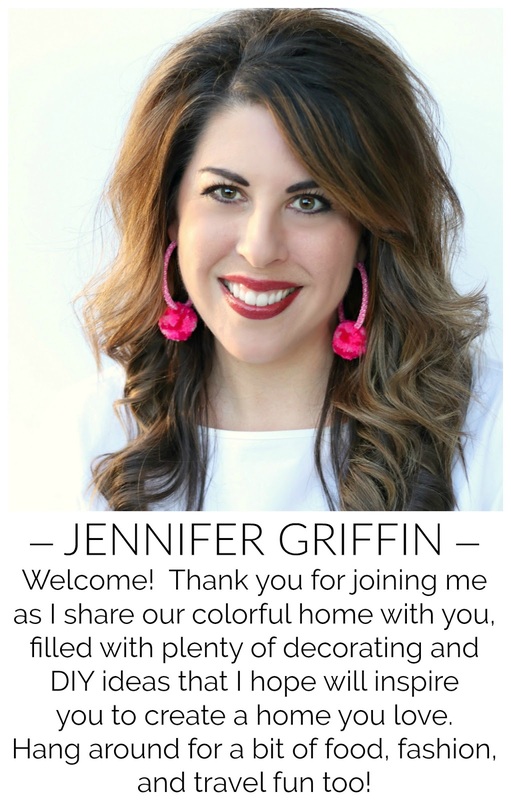 Jennifer, you are the master of the tablescape! 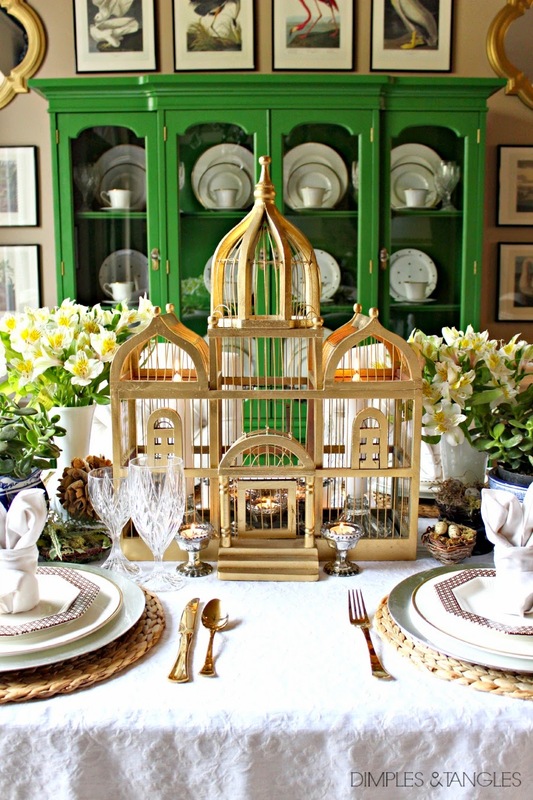 I love the birdhouse, that is SO perfect and lovely as part of an Easter table of all things. Also the colorful kitchen table is so joyful and fun. I have never visited that site before and just came back after reading today's devotional and subscribing. Thank you for sharing it! Happy Easter to you and your family my friend. 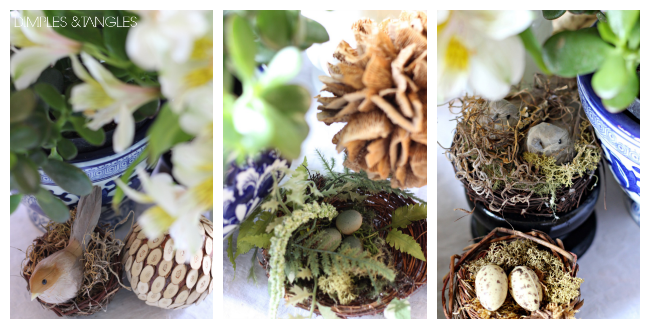 Two very different, but very beautiful tablescapes!! That birdcage is amazing!!! love them both, but i am so drawn to the first- that gold birdcage is calling me! So cute! I wish I had an excuse to decorate, but it is not happening! 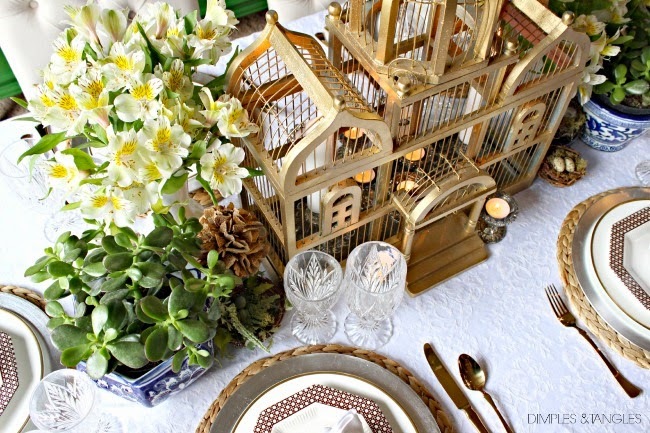 Both table settings are fantastic, but I'm especially in love with that birdcage! Great tables, you will probably find me at the kids table! Love the bright colors! I love them both! Enjoy your weekend! LOVE them both Jennifer....so pretty!! I love both of them! That is one great bird cage! Both of these are adorable and I love, love, love that gold birdcage! Happy Easter! Your tables never disappoint! They look absolutely beautiful! Happy Easter! 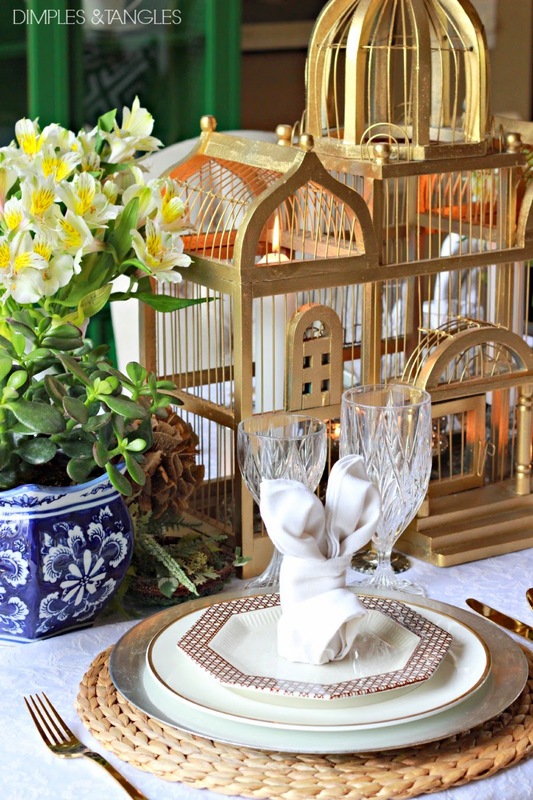 Such fun table settings, I love the birdcages! My mom has a pretty brass one, maybe we'll steal your idea! :) Happy Easter to you and your family, too! You really are the Queen of table settings. Love everything! You always have the best table settings! 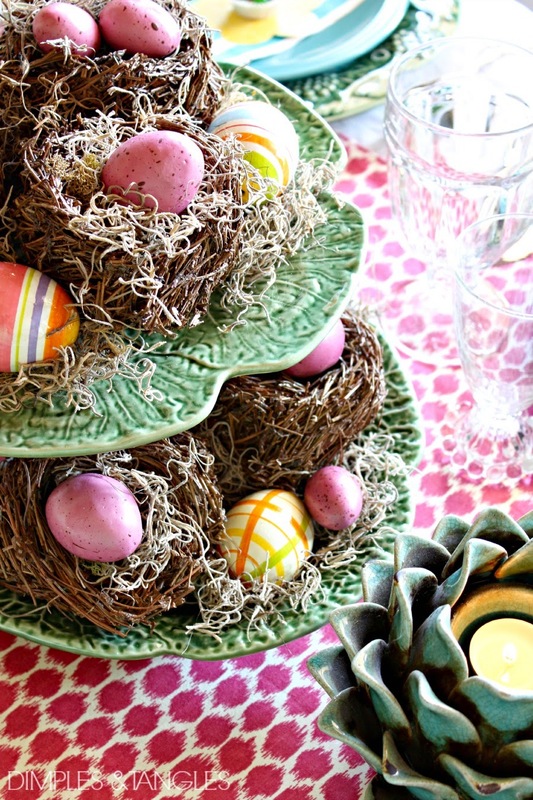 I love that birdcage in the center of your table and I just picked up one of those succulents at IKEA the other day too :) I hope you and your family have a wonderful Easter! These are so great! I'm so not a tablescape person and always use the food as decoration but you have me questioning that... Happy Easter to your lovely family! 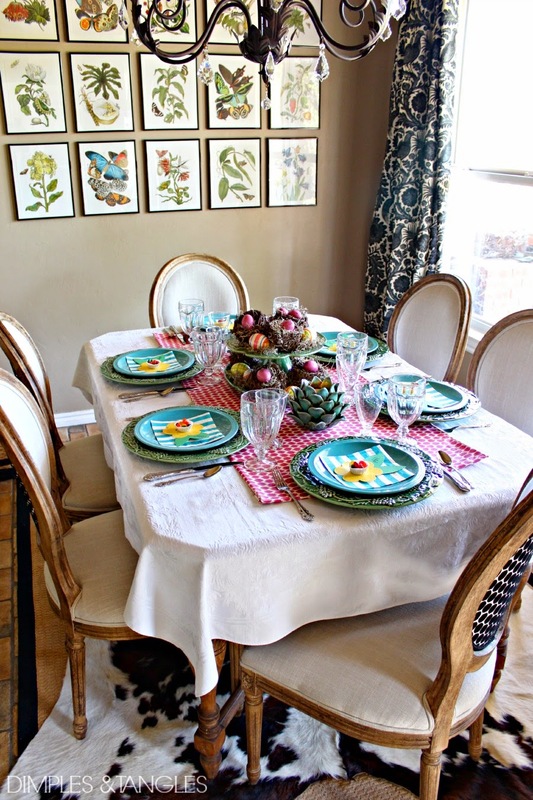 Both of your tablescapes are wonderful!! 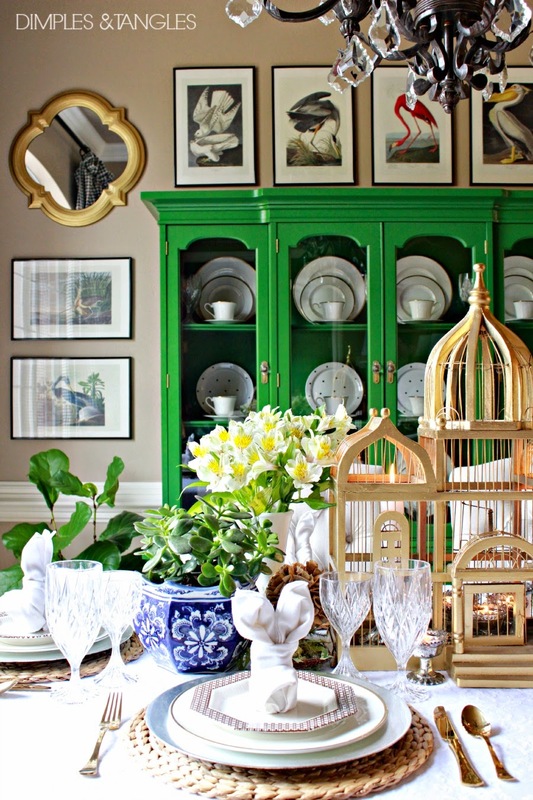 And I am so in love with your green china cabinet!! It is gorgeous! Happy Easter from Buttercup Bliss! 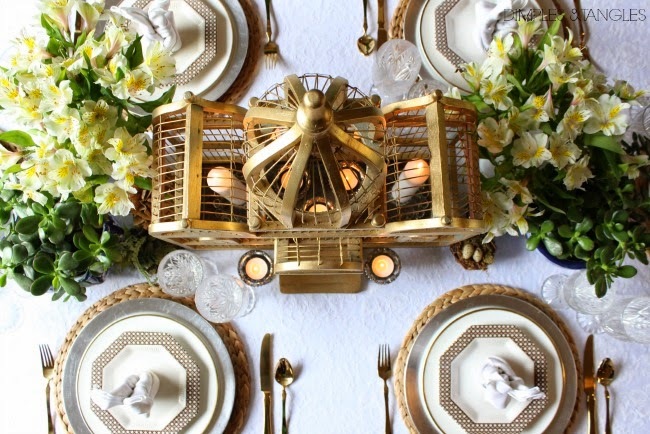 I am totally dying over your table with the bird cage - LOVE it. You should start a party planning business because your tablescapes are always amazing! Glad you had a nice Easter! Both tables are beautiful! 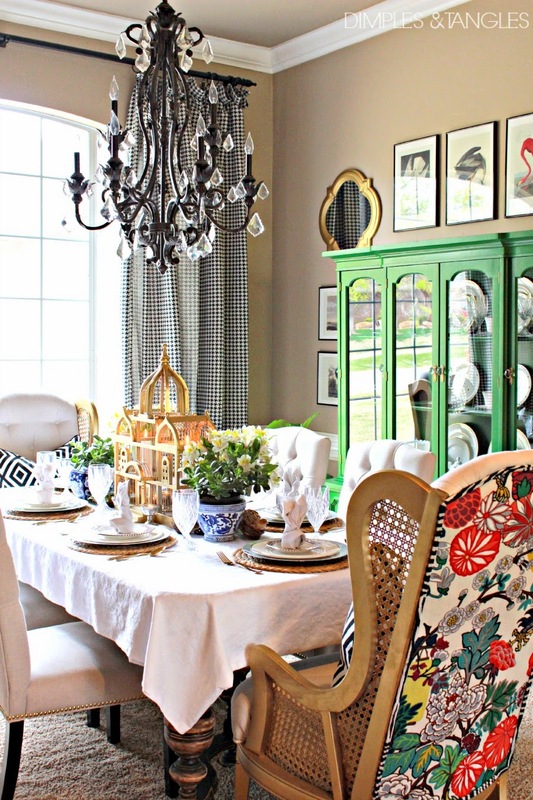 I just love the dishes on the dining table and yes, the bird cage too. Glad you had a wonderful Easter. Pretty tablescape. Did you paint the China cabinet in the background? It's a wonderful green! 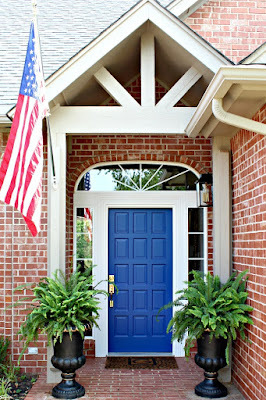 What paint color name did you use? Hi Claudia, Yes I did. It's Pine Scent by Behr.